Welcome to Gaza. In this short video you can see a small part of the chaos fracturing Gaza. Highlights include a Palestinian Arab man stating: "We Pray That Israel Will Come Back and Rule Us Again." * France Leads the Way by Encouraging Muslims to Leave. Who would have thought France would be setting an example that America and Israel need to follow. France is home to over 5 million immigrants — and the new conservative-led government doesn’t plan on making things any more comfortable for them. While the new regime in Paris is determined to curb illegal immigration, it is also looking to encourage legal migrants to reconsider their decision to stay in France — by paying them to go back home. The issue of encouraging Arab immigration from Israel has been a touchy one with calls for Transfer being made outright illegal, but the Israeli government found it entirely legal to ethnically cleanse Gaza of its Jewish population. Transfer remains the only realistic solution to the demographic and terrorist threat Israel faces. It's also the only real solution to the problem of massive illegal immigrants within American borders. * Muslim Taxi Drivers are denying access to the Blind in Australia. * IsraPundit writes on the anger at the continuing barrage of Sderot. 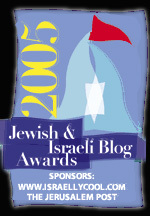 Young passionate, Noam Bedein in his Sderot Media Center video blasting around the blogosphere by me and others has a segment with him pointing to the wreckage of Kassem rocket tail fins that have fallen on Sderot wreaking death, destruction and havoc among the residents, especially the children. On each tail fin is a message and autograph from the killers; Hamas and Islamic Jihad ,in Arabic. I’m sure that we could get those messages translated so the death threats become palpable to viewers here in North America. This would incidentally be an excellent idea for a website. 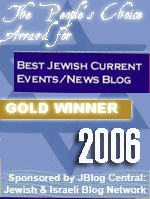 * RightTruth Covers some of the latest doings in the Middle East. SpaceRamblings writes that Ron Paul has been voted the Greatest Man in Human History. "The train ground through the tunnel, sparks lifting its wheels off the rails momentarily before gravity slammed them back down again." See, this is why you need Lemon as world dictator. I would pay not one cent for anyone to go home. They would want to go home, believe me, they would want to go quickly without packing . As for Sderot, sometimes you just gotta take matters into your own hands and get creative. That man who spoke of praying for Israel to rule Gaza once again---he's so brave to say that publicly without hiding behind a dark mask. I don't doubt he is speaking for a lot of average citizens fed up with terorism and praying for genuine peace and tranquility. But most of the "peace-loving, Pro-Palestinian" liberals of the world would prefer they be ruled, tortured, and murdered by terrorists. Yes, they're very pro-Palestinian, huh? These liberals who claim to care really don't. Average civilians, I imagine, know the truth, that Israeli rule means humane rule with law, freedom, and order. The images of the shooting/stabbing victim that an Israeli hospital agreed to treat was painful to watch. What caught my eye was the doctor stroking the man's forehead. I just wonder if his family was told an Israeli hospital was willing to treat him? Keli: There were a lot of arabs in Bethlehem that told ara-the-fat they preferred to be under Israeli rule. He went in at night, dragged them out in the street and slaughtered them. The others naturally shut up to avoid the same. So, yeah, these guys are even crazier than ara-the-fat was, so that incredibly brave man was writing "shoot me" on his forehead. I wonder if he's still alive? True Yobee. That man's bravery was in all probability a final act of suicidal desperation. Naturally the Peace Now activists have little concern for people like him. I hope that man is still alive.